The 2010 summer outdoors season appears to be getting off to a good start. Over the recent Memorial Day weekend, the traditional start to the season, visits to state parks and campgrounds up and down the East Coast increased significantly over last year. In New York, attendance at state parks jumped 17 percent over 2009. 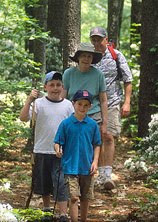 Summer bookings are up 16 percent at Massachusetts campgrounds. The New Hampshire Campground Owners Association predicts a 10 percent rise in business over last year. Some of the season’s fine start is being attributed to fine weather. Summer started early, dry, and warm across the Northeast — just the opposite of 2009. But some analysts also see a “back to basics” impulse at work, in which budget-conscious consumers choose to visit state parks instead of resorts and stay in campgrounds instead of hotels. Ironically, that same impulse may bring bad news to park visitors down the road, as states trying to balance their budgets pare down to basics. In many states, funding for state parks continues to decrease as cash-strapped state governments struggle to provide essential goods and services. Earlier this year, New York’s budget crisis forced the temporary closure of 41 state parks and historic sites. New Jersey Governor Chris Christie has proposed cutting funding for state park operations by about $7 million for the next fiscal year, which begins next month. According to the Massachusetts Budget and Policy Center, ongoing funding for Massachusetts parks and recreation has fallen by $56.7 million in inflation-adjusted dollars, or 43.8 percent, over the last ten budget cycles. California may be showing us the future. In 2009, facing a severe budget crisis, California governor Arnold Schwarzenegger slashed funding to state parks: 60 of the state’s 278 parks were closed and services at 90 more were reduced. Shortly before the holiday weekend, Schwarzenegger sent a budget to the California legislature for the coming fiscal year that would return funding for state parks to 2008 levels. Since then, government analysts have recommended a $22 million cut to funds for California's parks. Fewer public parks open and fewer public services in the parks that remain add up to fewer visitors: Last year, four million fewer people visited California parks than in 2008. The National Trust for Historic Preservation has apparently decided that the bad news for state parks outweighs the good. The organization placed the country’s state parks at the top of its list of America’s 11 Most Endangered Historic Places for 2010. Photo credits: Mass. DRC; Allegany State Park, NY.